Following are some important plant diversity exam questions. What is diversity? Which factors do cause it? Ans. The presence of variety of plants in the form of different taxas (specie, genera) is called diversity of plant. Different plants have different morphology, physiology, cytology and anatomy. 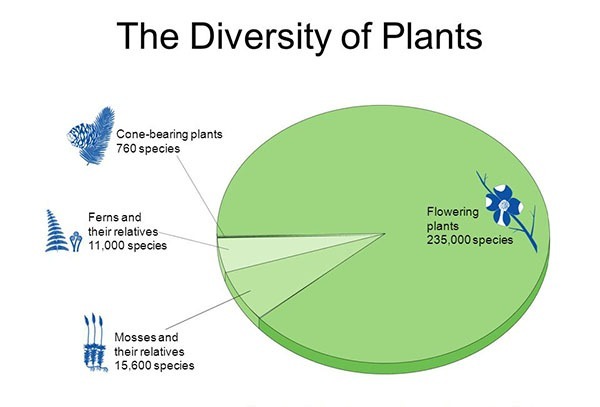 It produces diversity among plants. What is systematic? What does it include? Ans. The study of kinds and diversity of organisms and the evolutionary relationships among them is called systematics or taxonomy. The study of systematic gives the order and relationships among the organism. What are taxa? Give example? Ans. The group of animals with similar characteristics forms a taxon. For example, Amaltas (cassia fistula) shows similarities with other cassia specie (cassia senna). Both have compound leaves and produce bean. Therefore, all such plants are placed in the same taxon. Moreover, Cassia also shares characters with Bauhinia verigata (Kachnar). So, they are place in the same family. What is meant by Taxonomic hierarchy based on evolution? Ans. Carolus Linnaeus did not accept evolution. But still many of his groupings show evolutionary relationships. Morphological similarities between two plants have a genetic basis. It gives rise common evolutionary history. What is domain classification system? Why was it adopted? Ans. The systematists have concluded on the basis of studies of ribosomal RNA that all life shares a common ancestor. They find that there are three major evolutionary lineages. Each of these lineages is called a domain. The domain is present above the kingdom. What is Archeae? Give its evolutionary significance? Name division of non-vascular plants? Ans. Division Bryopsida, Division Hepaticopsida, Division Anthoceropsida. Ans. The phenomenon in which haploid gametophyte generation and diploid sporophyte generation alternates with each other is called alternation of generation. Define seed or what is seed consists of? Ans. A seed consists of an embryo packed ovule along with store of food within a protective covering.